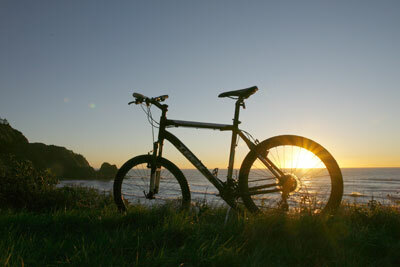 My poor stolen mountain bike in happier times. A few weeks ago, someone snuck into the breezeway of my apartment and made off with my beloved mountain bike. This story includes an open letter to said bicycle thief, along with information about five of the best places where they (or anyone else) can go riding near Grants Pass. First off, congratulations. You snuck into the breezeway of my apartment complex during the dead of night and stole my Trek 4300 Series mountain bike. I’m sure your parents are proud to have raised someone with the courage of a delinquent third grader. And truth be told, those wheels were a pretty good score. That bike cost me $550, with another $250 or so thrown in for tune-ups, new brakes and other miscellaneous improvements. There is one problem. You’re never going to get fair value for your newly acquired merchandise. Bicycle thieves don't command much respect — I’d say you fall somewhere between a peeping Tom and defrauder of the elderly — so even among fellow criminals I doubt you get more than $100. There’s the option of trying to sell it online, but rest assured I’m watching those websites pretty closely and don’t mind showing up to “pay” for it myself. So I have a radical solution. Since I probably won’t get my bike back, and you’re probably not going to get fair value, why not attempt something revolutionary? I know that’s a difficult concept. When you stole my bike, I suspect you were attempting to raise money to support your addiction to whatever drug best allows you to escape the reality of being a bicycle thief. But maybe, just maybe, my mountain bike is the key to redemption. There’s almost nothing as euphoric as swooping through big, fast turns on roads and trails in Southern Oregon’s forest. So, to help you achieve your transformation from scumbag to upstanding citizen, I’ve put together a list of excellent places to ride near Grants Pass. If using my bike keeps you from evolving into a drug dealer or bank robber then, hey, I’ll consider the entire episode a charitable donation. Below are five options for mountain bikers, ranging from beginner/intermediate to more difficult riding. I’ve included links to expanded information on each trail, but riders should do their homework and have a map before heading onto the trails. Two sources of information in Grants Pass include BikeKraft at 541-476-4935 or Don’s Bike Center at 541-471-3494. My bike would feel quite at home in this wonderful network of trails just south of Grants Pass off Highway 238. It takes about five or 10 minutes to reach the Espy Road Trailhead, which is located near Grants Pass Golf Club. The trails are well marked and have descriptions of difficulty. A personal favorite is to ride the Outback Loop, with detours on Timber Riders, Hogback and Ponderosa Pine Loop. All feed back into Outback Loop). Those trails are intermediate level and combined include about six or seven miles. There are views above Grants Pass and fast, fun drops. The Bridges Trail, also off Outback Loop, provides a greater challenge. Here’s a map of Cathedral Hills and here’s a photo gallery. Few areas are more beautiful and provide more fun riding than Taylor Creek Trail. The trail follows Briggs Valley Road 25, located just off Merlin-Galice Road, and winds through a multi-colored forest of titanic pine trees. The easiest and most fun ride is the “Return on the Jedi Trail,” which runs from the trail’s highest point, Lone Tree Pass, to Sam Brown Campground on a swooping route that runs about four miles one-way. The other option on Taylor Creek Trail goes from Lone Tree Pass to Tin Can Campground, though the riding is more advanced. You can find more information about Taylor Creek Trail here, you can find a photo gallery here and can find a video of the area here. At a dead end of Elk Lane in southwest Grants Pass, a network of roads and trails begin and make for some fun and challenging routes. I never actually rode this trail, but Richard Amneus at BikeKraft recommends it. The trailhead is located at the end of Elk Lane at a dead-end, with both roads and trails running to Stringer Gap. Amneus said beginning riders should stay on the roads while those of more advanced skill levels can ride off the roads down a network of different single track routes. For a map of Elk Lane’s roads and trails, click here. The name of this trail doesn’t sound very appealing, but don’t be fooled. This route through the green mountains of the upper Applegate Valley is one of the prettiest in the area. The riding generally is friendly to beginners, and once you’re up on the ridgeline (which might require walking your bike uphill a ways), the highlights include excellent scenery and some fun turns. The entire section of trail is 17.1 miles, but there are multiple trailheads along Little Applegate River Road south of Ruch for shorter rides. A favorite route runs from the Upper Little Applegate Trailhead for about eight miles one-way to Bear Gulch Trailhead. Both trailheads are connected by Little Applegate Road. For more information on the trail, click here. There’s an 18-mile loop that surrounds this reservoir located south of Ruch, which features intermediate riding with a few difficult sections that can be walked. The trail is narrow, scenic and fun, with high turns and trees that grow close along the trail. In spring, wildflowers sprout along the trail. If you don’t want to ride all 18 miles, there are shorter one-way sections, including a 9.2-mile ride from French Gulch Campground to Manzanita Trailhead along the eastern shore. So there you are bicycle thief — a bike and five options for riding. If you can’t turn your life around with that, feel free to go ahead and ride right off a cliff.